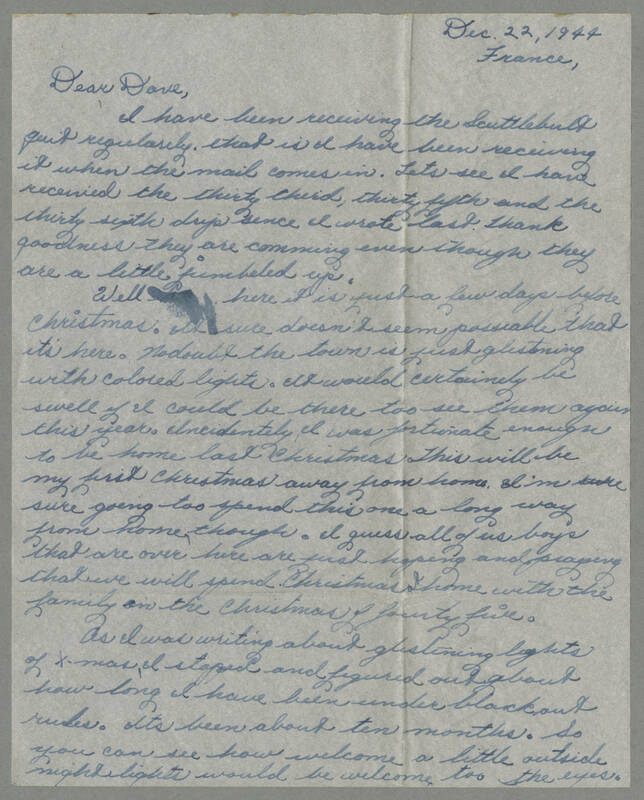 Dec 22, 1944 France, Dear Dave, I have been receiving the Scuttlebutt quite regularly. That is I have been receiving it when the mail comes in. Let's see I have received the thirty third, thirty fifth, and the thirty sixth drip since I wrote last. Thank goodness they are coming even though they are a little jumbled up. Well here it is just a few days before Christmas. It sure doesn't seem possible that it's here. No doubt the town is just glistening with colored lights. It would certainly be swell if I could be there to see them again this year. Incidentally, I was fortunate enough to be home last Christmas. This will be my first Christmas away from home. I'm sure going to spend this one a long way from home, though. I guess all of us boys that are over here are just hoping and praying that we will spend Christmas at home with the family in the Christmas of fourty five. As I was writing about glistening lights of X-mas, I stopped and figured out about how long I have been under blackout rules. It's been about ten months. So you can see how welcome a little outside night lights would be welcome to the eyes.